I was born in Chicago, Illinois, on June 24, 1908, the tenth and last child of John and Anna (Baker) Stob. My mother was well into her forty-first year when I was born and my father was well into his forty-sixth. Before my birth, the eighth child of the family a boy had died at the age of two, and so I came to know two older sisters and six older brothers. My parents were immigrants from The Netherlands. My father arrived in the United States in the company of two older brothers in 1880, when he was seventeen years old. The young men were cleared for entry at Castle Garden in The Battery, New York; Ellis Island was not yet in operation at that time. Born of peasant stock on November 10, 1862, in the Province of Groningen, Father was at an early age apprenticed to a neighboring farmer as a hired hand. He took up residence in a section of the barn where he slept on hay and was fed the simplest fare. Practically unschooled, he entered the work force after completing no more than the fourth grade. By then, however, he had acquired the ability to read and write, capacities that he employed with diligence and success throughout his life. The son of God-fearing parents, and brought up in the Reformed Secessionist Church, he was from his youth a deeply religious person who, as he advanced in years, became versed in Scripture, and acquired a considerable store of theological knowledge. Before leaving for America, he had made public profession of his Christian faith and was ever afterward a loyal son of his adopted American church, which he served with distinction both as deacon and elder. My mother was born in the town of Uithuizen, in the province of Groningen, on January 3, 1868. Her parents, whom I never met because they did not join in their children’s immigration, were members of the Reformed (state) Church of The Netherlands; but they appear to have lived on its fringes and to have provided their children with little or no religious training. It is a constant source of regret to me that I did not inquire more closely than I did into my mother’s lineage and ancestry, for she was a most sensitive, attractive, and intelligent woman, and there must have been something in her background that accounted for it. Arriving in the United States at the age of sixteen with a brother and two sisters, she settled in Chicago and underwent a conversion experience while attending worship services at the Dutch Reformed Church (now the Reformed Church in America) located on Hastings Street near Ashland. Mother’s piety and devotion to the Lord were ever afterward displayed in her life. 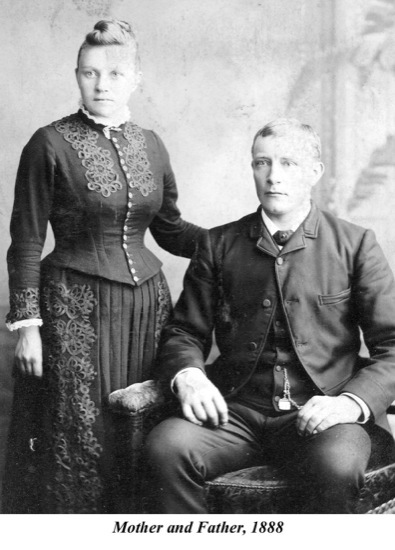 My father had joined the neighboring First Christian Reformed Church of Chicago, and though I have no record of their courtship, it is a matter of record that John Stob and Anna Baker were married on March 6, 1888. The wedding was performed by Rev. William Greve in the parsonage of the First Church, then located on 14th Street between Loomis and Throop. Apparently without benefit of honeymoon, the newly married couple established themselves on a farm several miles northwest of the church, in the vicinity of what is now Madison and Ridgeland Avenues. Three children all boys were born to my parents while they resided there: William on January 14, 1889; John on June 25, 1890; and Thomas on May 13, 1892. The names chosen for these boys, as well as those chosen for the rest of us, perpetuated the names of our Stob ancestors and near kin: William (Bill) was named after his grandfather, William Stob (b. 1828), who with his wife (Gertrude Huizenga, b. 1834) had come to the United States in May 1881. Six of the younger children accompanied them. Their firstborn, my father’s sister Jennie, remained behind with her husband and did not arrive until 1882. Money for the passage of all these people was apparently provided by the three sons who had come to these shores earlier. I never met my paternal grandparents: my grandfather died in 1900, and my grandmother died in faraway Minnesota when I was barely two years old. John, my second oldest brother, was named after my father, who himself bore the name of our earliest known ancestor, Jan Tunis (b. 1759). It was this Jan who in 1811, two years before his death, adopted the surname Stob after Louis Napoleon, King of The Netherlands (1806-1810), had ordered all members of the “Burger Stand” to adopt family names. Thomas (Tom) was named after my father’s oldest brother (b. 1856), who himself bore the name of his grandfather, Tunis Jan (b. 1784). I assume that the male dominance reflected in this name-giving was not resented by my mother who, not caught up in the then nascent women’s liberation movement, was not disposed to challenge the supposedly biblical principle of Adamic headship. 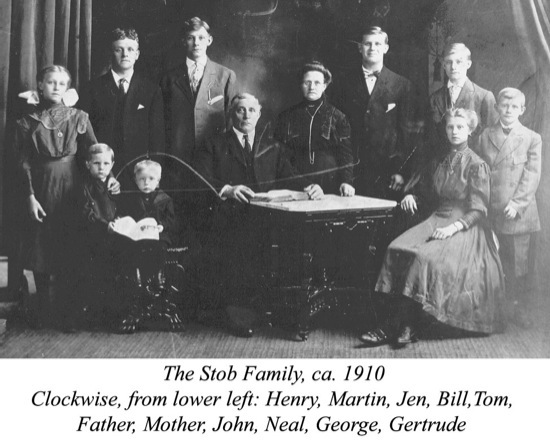 In the summer of 1893 my parents moved with their three young children to a farm near Prinsburg, Minnesota, whither the rest of the Stob family had migrated shortly before. My brother Neal (Cornelius) was born in Prinsburg on November 16, 1894; he was named after another of my father’s brothers. My sister Gertrude, named after her paternal grandmother, was born on October 12, 1896. And my only other sister, named Jennie after her paternal aunt, was born on April 13, 1898. My father served a term as deacon in the church at Prinsburg, and he and a Mr. Bolt planted the trees that later shaded the churchyard there. In 1899 my parents, with six children ranging in ages from one to ten, returned to Chicago, where my father established a hay and feed store on Blue Island Avenue, near 15th Street. The family lived in a spacious flat above the store, and here four more children were born. George, named after my father’s brother Geert, arrived on January 25, 1900. Martin, born in 1902, was named after another of my father’s brothers; but he lived only to the age of two, and his early death caused great sorrow to my parents. My mother often spoke of him in the tenderest of tones. Another son, born on July 3, 1905, was also named Martin. Because he was closest to me in age, it was with him and his peers, rather than with my older brothers, that I associated in playing the games we indulged in out-of-doors. Since my father’s youngest brother was named Henry, it was natural, if not inevitable, that when his youngest son arrived he should confer on him that very name. Thus I was given the name Henry at my baptism on August 2, 1908. The sacrament was administered by Rev. Evert Breen, then pastor of the church we attended, the First Christian Reformed Church of Chicago. Because the family moved from my birthplace on Blue Island Avenue before I had reached the age of three, I have no personal recollection concerning the residence, the neighborhood, or the events that took place there and then. History records, however, that Theodore Roosevelt was serving as the twenty-sixth President of the United States when I was born, that in the month of November following my birth William Howard Taft defeated William Jennings Bryan for the presidency, and that in the course of the same year Henry Ford brought out his Model-T. But of these events I was then quite unaware. I know about family life in my infancy only from hearsay. I have been told that our flat contained four bedrooms, from which I conclude that to accommodate two parents and nine children there must have been some doubling up. Things doubtless eased a bit when my oldest brother, Bill, left the household to get married on my very first birthday; less than a year later, my brother John did the same. Because of these departures, I came to know these brothers only from some distance and tended as a youth to associate more closely with their children than with them. It has been reported that my father’s physical prowess, evidenced in his easy handling of great bales of hay and heavy bags of oats, was celebrated throughout the neighborhood, and this report rings true: standing six feet tall, he had large, well-muscled arms and sturdy broad shoulders to match. My brother John is said to have been Father’s equal in strength, a circumstance that sometimes tempted him to engage in unnecessary, though usually successful, fistfights with the tough Irish lads who inhabited the area. In order to ease my mother’s burdens and to assist in my upbringing, my sister Gert quit her studies after completing the sixth grade of the small Christian school she had attended up to then. At that time the school held all its classes in rooms located in the basement of the 14th Street Church. Moreover, it offered no instruction beyond the sixth grade; for further study one had to enter the public school. It was perhaps this fact, among others, that my parents considered when they decided to terminate Gert’s formal education. In any case, at the age of twelve she became Mother’s helper, being required, she once told me, to peel a peck of potatoes each day for family consumption, and to do other chores besides. I was not destined to live long at the Blue Island Avenue address. It appears that around the turn of the century, the lure of Texas was strong among the Dutch in America. In 1894 a Dutch settlement was laid out in Alvin, Texas. In 1895 one was established in a place named Amsterdam; and in the same year the Port Arthur Land Company set aside 66,000 acres in Jefferson County for the establishment of yet another colony of Dutch farmers. By 1900, six hundred persons had settled within that county in a place called Nederland. But none of these ventures succeeded. The Alvin and Amsterdam communities disbanded after only a few years, and by 1905 the Nederland settlement counted only four Dutch families. It is likely that these facts were not known to members of the Dutch community in Chicago, for around the time of my birth, in response to attractive brochures, circulars, and press advertisements issued by a land promoter named Theodore F. Koch, several families in Illinois, Michigan, Indiana, Wisconsin, and Iowa purchased prairie land in the Winnie and Hamshire districts of Jefferson County with the view of establishing yet another Dutch colony in Texas. My father and a number of his Chicago friends and acquaintances were evidently taken with the idea, for in May and June of 1909, when I was approaching my first birthday, my father purchased 174 acres of land near Winnie at $35 an acre. He was not alone in doing so. From the First Church of Chicago, to which we belonged, many others joined the venture. I later came to know their names well: Hoekstra, Ter Maat, Vander Molen, Lanenga, Hoffman, Renkema, Vander Kamp, Blauw, Teune, De Young, Dykstra, Evenhouse, etc. So it happened that in 1910 my father sold his prosperous business and prepared his family for departure. He was, no doubt, excited about the prospect of living in what had been touted as an agricultural paradise. But he was also concerned to get his younger children out of a city that, in our neighborhood at least, was rife with crime and violence. The notorious Valley Gang, a number of whose members died in the electric chair, is said to have been headquartered in the district adjacent to ours. On November 14, 1910, Father, Mother, and six of their children, ranging in ages from two to sixteen, entrained on the Sante Fe railroad bound for Texas. Three members of our family stayed behind. Bill and John were already married and beginning to establish families of their own. Tom, who had attended business school was, at eighteen, gainfully employed and had no interest in farming. He was therefore allowed to remain in Chicago and live with his brother Bill. Of the train trip to Texas I have no recollection, and of my subsequent stay in Winnie I have only the faintest. But bits of information have come my way, and from these a tolerably true story can be constructed. It was not, I am told, a “farm” that my parents bought, but an expanse of untilled prairie land. On this land they first had a barn built, and the family lived there while the dwelling house was under construction. The house (of which pictures exist) was a large, two-story structure with an ample screened-in circular porch enclosing the roomy interior. It was said to be the best house in the region, and arriving visitors, including pastors occasionally sent down from Classis Pella, normally stayed under its roof. We lived about a mile from the small roadside town of Winnie, which itself lay twenty-five miles south of Beaumont and fifty miles east of Houston. The Gulf of Mexico was twenty miles away. Starting a farm is no small undertaking. Besides providing shelter for people and animals, one has to plow, fertilize, and sow the land, dig wells, lay ditches, and do a score of other things. One needs horses, wagons, plows, seed, and fertilizer for this enterprise, to say nothing of muscle and will power. Because the latter qualities existed in fair supply, Father was able, with the energetic assistance of Neal, to get part of the land broken up and readied for sowing during the winter of 1910. In the spring they planted orange and fig trees; and in the ensuing few years they grew sweet potatoes, corn, and cucumbers, as well as some peanuts and watermelon. But the promised and hoped-for plentiful harvests did not materialize, and marketing such crops as the land yielded proved more difficult than they had anticipated. But the colonists did not immediately give up. They came together, shared their concerns, and provided each other with help where needed. Father appears to have been among the leaders in the community. Notices appearing as early as July 1911 disclose that he functioned as the president of the Cooperative Fruit and Tree Growers Association of Winnie, Texas. He also served as “reader” at the Sunday worship services held in the little frame church that had been erected near our house on land donated by the developer. Concerning the children, Neal spent his time on the land as Father’s chief assistant. Gert, who turned fifteen in 1911, took employment as a live-in maid in nearby Winnie, but she normally spent her weekends at home with us. Jen, George, and Mart attended a one-room country school some distance from our house, and doubtless assisted with the household chores when school was out. Meanwhile, I suppose I did what three-year-olds normally do, but I cannot recall any particulars. There is, however, one event that I quite vividly remember. On March 6, 1913, my parents celebrated their twenty-fifth wedding anniversary. Approaching my fifth birthday, I recall mingling with the many well-wishers who came to the house bearing gifts and then feasting on the pies and cakes my mother had baked. However, even as these festivities were going on, clouds of doubt and sagging hopes brooded over the colonists. The land simply did not yield its fruits. If it was not long-lasting drought that scorched the crops, it was equally long-lasting rain that rotted them. Already in 1912, some families had surrendered their mortgaged farms and returned to their place of origin. Most of the settlers fell increasingly into debt, including the Stobs. Already in February 1913 my parents made efforts at refinancing, but these desperate expedients did not succeed. 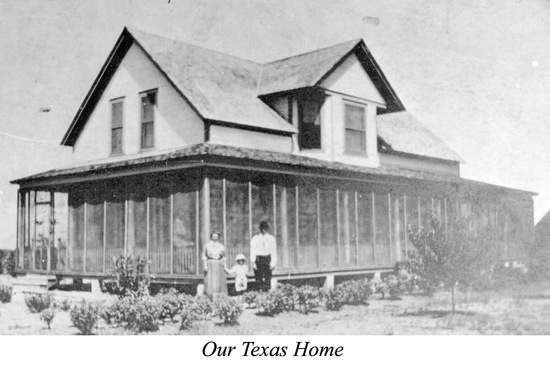 Thus, in the summer and fall of 1913, having lost most of their investment and sensing that the colony had no prospect of enduring, my parents settled their Texas affairs as well as they could, and with several other families broke their ties to a once enticing and promising enterprise. The family returned to Chicago on December 7, 1913. The Texas sojourn had lasted a scant three years. Father was now fifty years old, with no immediate prospect of employment; and I, at five and a half, had not yet been to school. I do not know what forces shaped and molded me during the first five years of my existence on this earth. I must have seen, heard, smelled, tasted, and touched a great variety of things, and I know that I spoke and was spoken to, that I laughed and cried, that I acquired elementary skills, and that I was loved, instructed, and disciplined. But there is such a lock upon my memory as keeps me, despite my best efforts, from bringing anything clear and concrete into consciousness. Some events occurring in the outside world during this time must have come to my attention for, as I later learned, my family’s engagement with public affairs was lively and constant. I suspect, therefore, that my parents and older siblings discussed in my presence Admiral Peary’s discovery of the North Pole in 1909, Roald Amundsen’s expedition to the South Pole in 1911, the overthrow of the Manchu Dynasty in China by Sun Yat Sen and the establishment of the Peace Palace in The Hague during the same year, and, especially, the sinking of the Titanic and the election of Woodrow Wilson in 1912. But of this, too, I have no recollection. The experiences of my infancy lie beyond my powers of recall.